AAMCO is halfway through a five-year strategic plan that began in 2014 and has led to some of the best years in its storied history as a franchise system. Led by CEO and President Brett Ponton, formerly the President and CEO of the largest franchise company within Jiffy Lube operating nearly 575 units across America, the 52-year-old franchise system has made remarkable progress on all fronts, creating a franchisee-focused performance culture and pushing average unit profitability across the country. The AAMCO leadership team launched a five-year plan to accomplish two goals: 1) simplify the business model to make AAMCO easier to operate and easier to scale than ever before; and 2) revamp the customer experience to win trust, create new revenue streams and drive profitability to AAMCO franchise owners in their stores. The industry has taken notice. In 2016, Franchise Rankings named AAMCO as the best overall automotive franchise in the United States, as well as the No. 5 best franchise to buy in any industry, period. Entrepreneur included AAMCO on its prestigious “Franchise 500” list for the third year in a row — the same three years that the five-year plan has been in progress. What preceded the five-year plan? Prior to the roll-out of the five-year plan, the AAMCO leadership launched the Total Car Care initiative to help AAMCO franchise owners grab a bigger slice of the general automotive repair market, which generates $62 billion a year in sales according to IBISWorld research. One thing was clear — they knew they needed to simplify the business model. AAMCO created Global Powertrain Systems (GPS) and built a transmission remanufacturing facility in Newnan, Georgia, outside of Atlanta. This ability to produce remanufactured transmissions has simplified the transmission installation process for franchisees, reducing the time to replace a transmission from four to five days to fewer than two. AAMCO franchise owners can now purchase high-quality remanufactured transmissions from the remanufacturing facility; the company can deliver a remanufactured transmission to more than 70% of its franchisees the day after the order is received. 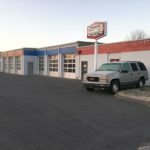 This gives AAMCO franchisees immediate access to a supply chain with preferred pricing, and it helps keep overhead costs low while allowing AAMCO franchise owners to dedicate more time and service bays for the Total Car Care segment and increasing their profitability in that space as well. Below is a chronological look at the five-year plan that will explain in detail what AAMCO has accomplished so far and the planned results by the end of 2018. AAMCO made a significant investment to overhaul its digital footprint and partnered with Reputation.com to control and monitor customer feedback online. AAMCO franchisees are outfitted with a kiosk to allow customers to give feedback. If the feedback is positive, it is published online. Negative feedback is routed directly to an internal dashboard so that AAMCO franchise owners have deeper insights into how they can improve customer service. New websites and digital marketing strategies have greatly increased lead generation for franchise owners. AAMCO ushered in a bold new era of innovative technology with AAMCO University, a state-of-the-art training facility in Newnan, Georgia, outside of Atlanta, that serves as a pathway to success for franchise owners and technicians. For AAMCO center owners, there are more than 250 hours of training, as well as more than 300 online courses focused on comprehensive business ownership principles and procedural applications. Also in 2015, AAMCO partnered with Salesforce, a pioneering company that delivers cloud-based customer relationship management (CRM) software, to create a customized CRM of their own. In December of last year, AAMCO rolled out a platform within the CRM to improve the level of support that franchise owners receive. For the first time, AAMCO franchise owners can have access to the entirety of their support network: operations, marketing, accounting and more — with a real-time log that records support calls so that the executive team can have visibility and be accountable to our franchise owners. 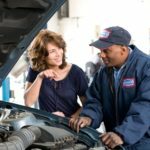 AAMCO is in the process of rolling out a national consumer financing platform that enables new customers to have immediate access to credit approval from several financial institutions for their vehicle repairs. By filling out information on a website or through a kiosk in an AAMCO center lobby, customers with good, bad or no credit are able to find a solution that suits their budgets and eases their financial burden. Simplify the workflow by making jobs more efficient. Utilize technology to improve the customer experience in AAMCO centers. In the future, Customer Service Managers will greet customers with tablets so that they can start the consumer process before they even they walk in the door. AAMCO invested in mobile technology in order to provide customers with detailed information on their vehicles in order to be more transparent, as well as to provide them with more options. Franchise owners are provided with data to improve marketing initiatives and win more customers. Franchise owners have the ability to check on their stores, no matter where they are in the world. The AMS system is hosted on cloud-based infrastructure, which can allow owners to have detailed information on their stores, so that they can make better decisions going forward. AAMCO is enhancing their Total Car Care offering to the system and started by launching AAMCO Expert brakes repair services. 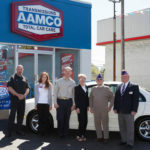 AAMCO made the significant investment to include training (in the form of several online courses and in-market, hands-on training sessions) and marketing support for AAMCO technicians to become industry leading experts in brake repair, helping AAMCO franchise owners to further increase the revenue of the Total Car Care segment. 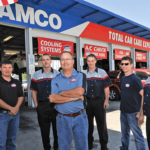 AAMCO will also continue to re-focus the Total Car Care offering by including heating and air conditioning services. AAMCO will roll out new training and support for this offering in the upcoming months. AAMCO plans to launch a national center refresh campaign to update AAMCO Centers across the country with a consumer friendly experience and a contemporary look and feel. The remodeling will have a tremendous impact on growing the AAMCO customer base and providing new and existing customers with an improved experience at AAMCO. The details will be announced early next year. AAMCO also plans to enter the tire services industry in 2018, giving AAMCO franchise owners a chance to win an outsized share of the $46.8 billion tire industry. Details to come closer to launch.